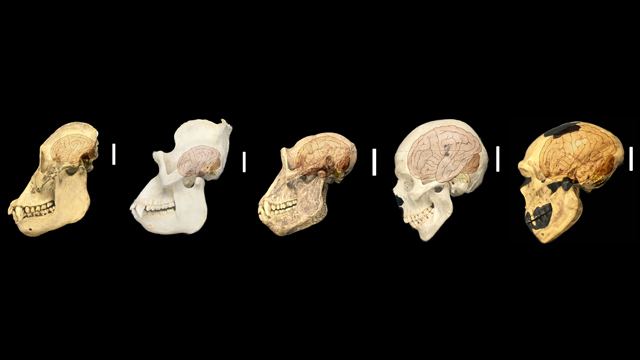 Left to right: orangutan, gorilla, chimpanzee, human, and Neanderthal skulls overlaid with an illustration of the corresponding brainFIDDES ET AL.In the last few million years, the brains of humans and human ancestors have quickly evolved to be much bigger and more complex than their primate relatives. The genetic and molecular mechanisms that drove this expansion are still poorly understood, but two studies published today (May 31) in Cell describe a new gene family unique to humans that may have played a role in building bigger brains. The NOTCH2NL gene family is expressed during human cortical development and promotes neural progenitor cell renewal, which leads to more neurons. We have an exceptional opportunity to find the changes that occurred in our ancestors’ DNA that made us human. In order to investigate unique human genes involved in cortical development, Vanderhaeghen and colleagues sequenced RNA from human fetal cortical tissue collected after medical pregnancy terminations that occurred between seven and 21 weeks of gestation. They identified 35 genes specific to humans and their immediate ancestors with open reading frames that suggested the genes actually code for proteins. The 35 genes arose through gene duplications and were part of 24 gene families. 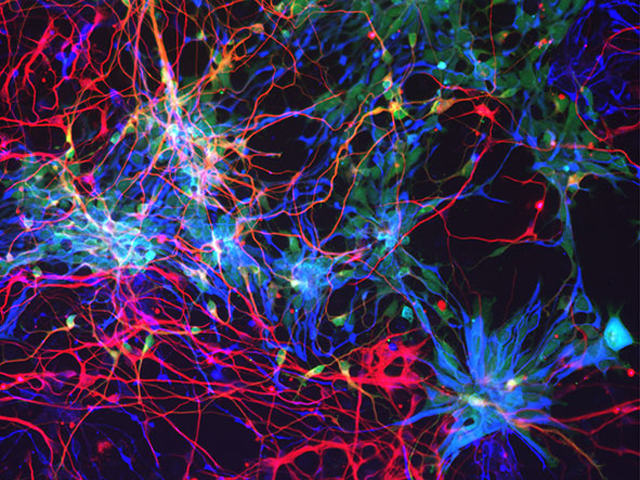 The researchers then electroporated members of nine of the gene families—selected based on their expression in progenitors during cortical neurogenesis—into the brains of developing mice. 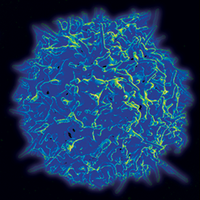 They found that gain-of-function of a particular gene, NOTCH2 N-terminal like B (NOTCH2NLB), maintained cells in a progenitor state, rather than following their typical timeline of differentiation. NOTCH2NLB is related to NOTCH2, which is conserved across mammals and known to be involved in neurogenesis via the Notch signaling pathway. Next, the team manipulated the function of NOTCH2NLB in an in vitro human embryonic stem cell model of cortical development. The group showed that its overexpression leads to re-entry of progenitor cells into the cell cycle via the Notch signaling pathway, resulting in a corresponding expansion of cortical progenitor cells and an eventual increase in the quantity of neurons coming from these progenitors. Showing that more NOTCH2NLB activity can increase the neuronal progenitor population is fascinating, Vanderhaeghen says, because it mimics what may have happened during the evolution of neurogenesis. The NOTCH2 duplications could have acted as a real-life gain-of-function experiment, leading to more neuronal progenitors and neurons in the human cortex than exist in the brains of other animals. When the authors investigated the genomic context of NOTCH2NL, they identified four NOTCH2NL family members, three of which—NOTCH2NLA, NOTCH2NLB, and NOTCH2NLC—cluster together on the first chromosome. Their analyses revealed that NOTCH2NL-like genes exist in other primates, including gorillas and chimpanzees, and came from a duplication of NOTCH2. But the only species with functional NOTCH2NL genes are humans and their closest ancestors, Neanderthals and Denisovans. 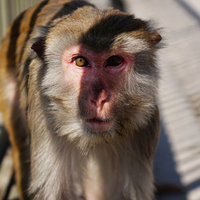 In other primates the NOTCH2NL family members are pseudogenes. The researchers determined that NOTCH2NL became functional in hominins about 3.5 million years ago after a gene conversion event that combined the promoter and first exon of NOTCH2 with NOTCH2NL. 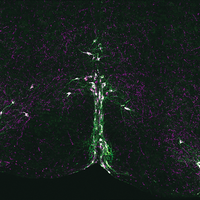 This lengthier gene was then duplicated to give rise to A, B, and C.
Consistent with the findings of Vanderhaeghen and colleagues, the team found NOTCH2NL expression in neuronal progenitor cells in human fetal tissue, that its overexpression could affect mouse cortical development, and that NOTCH2NL functions within the Notch signaling pathway. They then deleted NOTCH2NL genes in human embryonic stem cells and directed them to develop into cortical cells. Without NOTCH2NL, the resulting organoids were smaller and made neurons earlier in development, suggesting that NOTCH2NL in the normal human brain delays the differentiation of progenitor populations. Human cortical cells in vitroSUZUKI ET AL. In addition to the links to evolution and development, the researchers also suggest a NOTCH2NL connection to a rare disease known as 1q21.1 distal deletion/duplication syndrome. People with this syndrome have a duplication in or lost a portion of chromosome one and can exhibit macrocephaly or microcephaly respectively, along with other neurological symptoms, such as schizophrenia and autism. The authors found that the site of DNA breakage in six people with this syndrome was in or close to the site of NOTCH2NLA and NOTCH2NLB. “The functional evidence that has been put forth in these papers is super promising and exciting. This a great start,” says Megan Dennis, a geneticist and genomicist at the University of California, Davis, who was not involved in the studies. One open question is whether “this particular gene [NOTCH2NL] is necessary and actually contributed to the extension of the neocortex. That’s a really hard question to be able to solve because so many other different variants could have contributed,” she says. 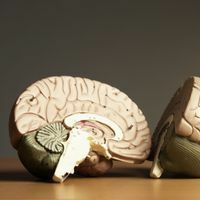 The two studies have done well in their characterization of cortical genes, says Barbara Finley, who studies brain evolution at Cornell University and did not participate in the work. But she cautions that attributing the evolution of bigger brains solely to human-specific genes could be problematic based on previous research showing that animals with bigger brains undergo longer periods of neural development. “If you’re talking about what makes our big cortex, the only real possibility is whatever controls duration,” she says. I.K. Suzuki et al., “Human-specific NOTCH2NL genes expand cortical neurogenesis through Delta/Notch regulation,” Cell, doi:10.1016/j.cell.2018.03.067, 2018. I.T. Fiddes et al., “Human-specific NOTCH2NL genes affect notch signaling and cortical neurogenesis,” Cell, doi:10.1016/j.cell.2018.03.051, 2018.